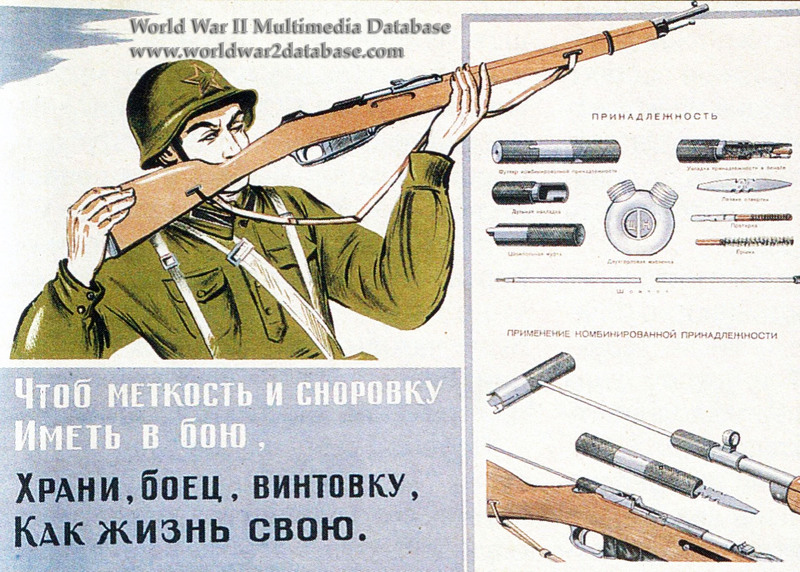 Wartime Red Army instructional poster showing the cleaning tools of the Mosin Nagant Model 1891/30 rifle. Millions of the Model 1891/30 were issued to Soviet soldiers. They can be identified by the rough production methods which characterized unskilled labor working with crude tools. Especially in 1941-1942, Mosin Nagant Model 1891/30 users often lacked training in maintaining their weapons. In 1943 concerted efforts to educate soldiers in proper weapon discipline helped to improve effectiveness of the Red Army. The main caption at lower left reads, "To have accuracy and dexterity in combat, protect your rifle like your life." The Mosin Nagant Model 1891/30 cleaning "accessories" are in the upper right. They assemble into the "application of the combined accessories" in the bottom left. The Mosin Nagant cleaning kit could be condensed for easy storage and carrying.